Budget Blinds, Bolton, sell blinds, shutters and now awnings! Budget Blinds have a new product in their ever growing showroom, awnings. Motorised and manual awnings are the 2 types on display at Budget Blinds. A remote control is standard with every motorised awning. 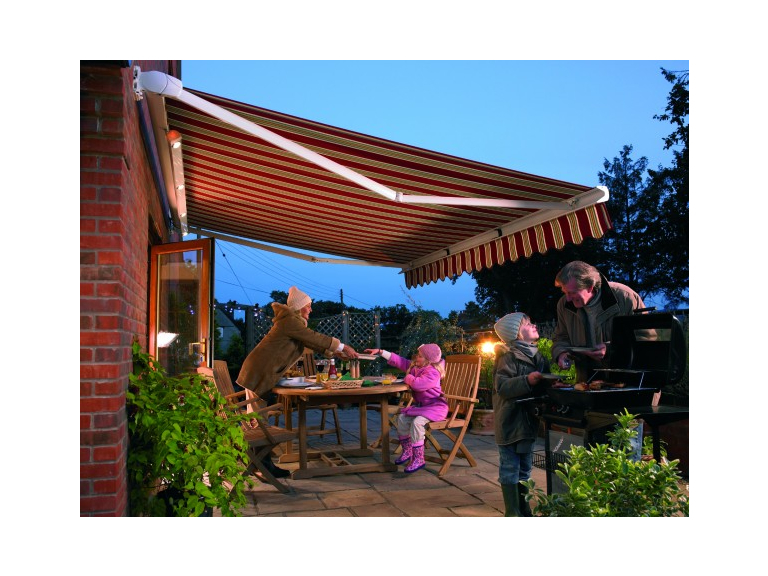 It is very simple to use, and guarantees you have complete control over the awning. There are 98 Dickson (a leading awning brand) fabrics to pick from. 55 of these are plain and the remaining 43 are striped. They have been specially designed to go in a garden, so the colour won’t fade. Fabrics have been treated for protection from the sun and water. If you want to check what the weather is like after you’ve put up your awning, weather sensors are available. These sensitive accessories will check the wind, sun and any other vibrations that are in the air. Weather sensors aren’t the only extras you could get on your awning. Additional lighting, cassette system and heating options are on offer. An integrated timer might prove useful if you know when you want your awning to be fully extended. Budget Blinds will tell you how to set it. It doesn’t matter what size you want your new awning to be. As long as the width doesn’t exceed 5.5 metres, Budget Blinds can make your awning to measure. Special technology on the Valencia awnings ensure that these blinds are protected from stains, don’t rot and have a wall against dirt. The Cleangard technology used is effective at stopping bagginess too, meaning the awning will always look as good as new. Budget Blinds guarantees your awnings for 3 years anyway, so even if faults occur you’re covered. All the awnings Budget Blinds sell are made in the UK using only the best components. There are 4 different valance shapes to ponder over. All of them look fabulous.